The best thing about La Campagnola is the large outdoor seating area and grumpy waiter Raffaelle. If your Italian isn’t great, check the blackboard for the day’s dishes or ask for a menu. Very good gnocchi alla sorrentina, linguine alle vongole, and mixed fried fish, plus great friarielli (a wild green found only in Campania). 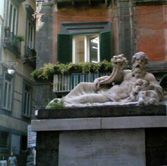 In Naples’ historic center, La Campagnola is a good for those with few euro and a fascination for people-watching. No credit cards. Open Monday-Saturday for lunch; Tuesday-Saturday for dinner. Closed Monday evenings and all day Sunday.